Verse: Matthew 28:6 - He is risen as He said. - Using black watercolor and cotton swabs, paint the cross on the Cross worksheet. Stamp a heart handprint on the cross. Keeping the hand tight, paint the entire hand red. The heart is created with two prints laid together at an angle. The finger tips are at the bottom of the heart. You can also make small hearts using two thumb prints arranged to make a heart. - Explain that the story of Jesus' death is very sad. But we don't have to stay sad because the best part is coming. Explain that Jesus died for our sins for the bad choices that we make. 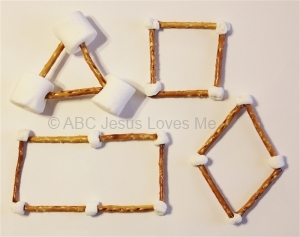 - Use pretzel sticks (or toothpicks) and marshmallows (large works best) to make squares and triangles. Poke the ends of the pretzels into the marshmallows to hold the pretzels together. Demonstrate that the difference between a square and triangle is one side. - Using cotton swabs, paint the Square and Triangle worksheet with red, orange, and black. Using the Apple Tree Number Book,point and count the apples on the trees. Continue to point and count items you find throughout the day. 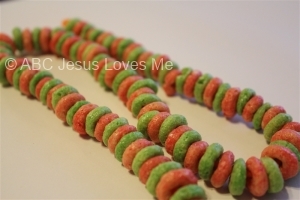 Create an edible necklace by threading Fruit Loops on a string. Play Red Light, Green Light - This game is a fun way to practice obedience (stopping when told to do so). Play this game while on a trampoline, doing an activity at the park, or running or walking beside each other. Teach the child to immediately stop when given the "red light" command. If the child learns this skill, it can be used in an emergency situation such as a parking lot.